American modern electric blues guitar virtuoso. Born: 27 November 1942, Seattle, USA – Died: 18 September 1970, London, UK. A self-taught guitarist, Hendrix began his musical career backing such R&B greats as Ike and Tina Turner, Sam Cooke, Wilson Pickett, Little Richard, The Isley Brothers, and B.B. King. Brought to London from New York by former Animals bassist Chas Chandler, Hendrix quickly established himself as the brightest new star on the burgeoning progressive rock scene of the early '60s. Along with bassist Noel Redding and drummer Mitch Mitchell he formed The Jimi Hendrix Experience. After a landmark appearance at the Monterey Pop festival, their debut album Are You Experienced was released in September 1967. The album, and its 1968 successors - Axis: Bold As Love and the seminal blues-oriented developments of Electric Ladyland - earned Hendrix international acclaim as a premier rock instrumentalist and innovator of his generation. A 'greatest hits' collection, "Smash Hits" (1969), and an in-concert memento of his historic Monterey appearance, "Otis Redding / Jimi Hendrix Experience at Monterey" (1970), followed before his untimely death. A posthumous studio album, "The Cry Of Love", was released in January of 1971, followed by the double album soundtrack to the documentary film "Jimi Hendrix" in June of 1973.
held down by his manager and force fed an overdose of barbiturates washed down with a jug of cheap red wine. "success don't come for free". I don`t care, 14 is good ... not what i expected, but it`s ok.
Jimi had a big talent in song-writing and was also a badass guitar-picker, but people tend to forget that the Experience wouldn`t be that much of a experience without a badass drummer like Mitch, or an very talented calm anchor Noel. The records were produced in a bad way to make Jimi look glamorous, the covers showed him mostly sitstanding above the other band members and in the Twosome "Are you experienced / Axis bold as love" lp Mitch isn`t even mentioned on the Cover or the plate. They say "The good die young". I think that maybe for some it's meant to be so we can only remember them at their very best as opposed to watching them age and in some small way take away from their legacies. Like champion fighters who stay in the ring too long. We had Jimi for a short time and in that short time he changed the course of rock history. 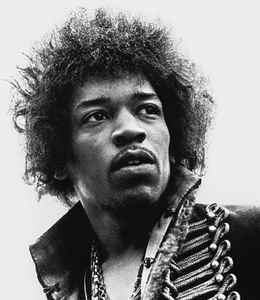 Better to remember him as he was then every time you hear Red House, Little Wing or Purple Haze. Because as long as we have his music, we have him. I'll always miss him.I have no one to believe in. James Marshall Hendrix is the Chuck Norris of Rock! A badass of the highest proportion. Thestuff he did with The Band Of Gypsies is the most funky Rock'b Roll ever recorded. Stonw cold grooves. nything he put on tape is sensational. You would think that after 40 years the unreleased stuff would lose quality, no chance - check the 2010 Seattle West Coast Boy 4Cd set for proof. You can play any of the tunes from CD 3 and 4 from his later years and will not find a weak track. In the few years he had the chance to get his music out on tape he laid down so much fantastic stuff. it is incredible. A pity we don't have more from this guitar god, but we five thanks for what we got. Hail Jamws marshall Hendrix ! Jimi Hendrix was married to his guitar. When he was born in the slums of Seattle (USA) a guitar symbolized humane warmth, and he loved it all the 27 years of his life. He caressed and kissed it, but he also hated it, smacked it and smashed it against the wall, only to warm his blues out of his string body. He once said; "Whenever I die, I want people to play my music, want them to do whatever they like! ".Jimi Hendrix died, his guitar became a widow, a lonesome lover who has no time for mourning because it has to fulfil Jimi's will. And really, guitars all over the world produce Jimi's sound captivating and carrying away audiences of fans by the same unlimited magic music.